The VRX915S a very compacthigh power, suspendable single 15" direct radiating subwoofer is intended as companion subwooferfor the VRX928LA. The suspension system is designed for full compatibility with the VRX928LA Line ArraySystem and with the VRX-SMAF array frame. The M20 mounting plate allows for utilization of the adjustablepole mount SS4-BK. 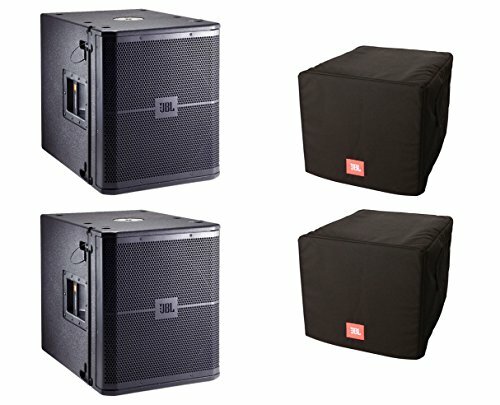 He JBL VRX915S-CVR Padded, Protective Cover (Black) is designed to fit over a JBL VRX915S subwoofer. The cover is made from 1200 denier nylon with a waterproof backing and 10mm padding for complete protection. There is a Speaker Shield that is a rigid polyethylene sheet sewn into the front panel which protects the grille and speaker. It has handle access covers with touch fastener closure that allows the speaker handles to be used with the cover. A large external storage pocket provides generous storage space for cable, etc. It has an embroidered orange JBL Logo on the front.